Eternity Playhouse, 31 October to 30 November – You can grab your Tickets here. Why do we leave our marriages? Rarely, and usually restricted to the hallowed halls of abandon in Las Vegas, do we enter into marriage lightly. It is something talked over with everyone we love, it is preceded by many months and usually several years of intimate relationship and true to its history, is often seen as a political act involving children and property. Of all the many gifts the LGBT community have given us, surely the “re-framing” of marriage as an institution is one of the most valuable. Marriage is burdened with a lot of historical baggage, and all this needs to be included in its modern definition if we are to claim it for a new generation, but the LGBT community have given us a way to view the political act of marriage as a positive thing, to see what some women and men (this woman in particular) viewed as a trap, a prison, or a jail as an important and powerful declaration about your practical responsibilities to the person you love. The more we think about why two people are together, the more it makes sense to celebrate that as a deliberate choice, rather than an inevitable act of nature beyond anyone’s control we then spend much of our lives resisting. The institution of marriage today can be defined as calling it like it is. It’s being real about your interactions with the world. But why do we leave? In this very peculiar age we live in, where we’ve so easily abandoned so much of ourselves to the “inevitability of technology” it is probably no surprise that one-third of all divorce filings in the U.K. contain the word ‘Facebook,’ however we would be foolish to imagine Facebook is anything other than an easy out for the issues that were already in existence. I would assume, for example that if there is an increase in social medias contribution to divorce, there is probably a corresponding decrease in the office fling as causing marital demise. Either way, the affair whether real or cyber is a symptom and not a cause and research tells us, over and over again that a lack of communication that leads to a reduction in intimacy is the primary reason couples decide to separate. In other words, the straw that breaks the camels back of that huge commitment, was most likely due to small acts of abandon at crucial moments, that were symptoms of another problem. So why do we stop communicating? Nick Enright wrote Daylight Saving in 1989, but his primary points, that marriage is important, that it will suffer from a lack of communication and that its demise usually revolves around one foolish event that will go on to distort everything, are even more relevant today than they were in the 80’s, when our society was confronting the rosy picture of marriage as if it were a great lie. Enright used the sitcom format, a form of television that was really coming into its hay-day in the 1980’s to examine the precise moment a marriage falls apart. Daylight Saving is as much a commentary on the growing importance of the media, celebrity, financial success and the way television is defining our lives as it is about marriage and the event that will make or break it. Felicity’s (Rachel Gordon) marriage is in crises due to a breakdown in communication with her husband Tom (Christopher Stollery) but it is not until she sees herself interviewed on television that it becomes real for everyone else and subsequently her. Because of her television interview everyone around her thinks she is depressed and having an affair – both of which become true after television has suggested it – and Josh (Ian Stenlake) feels he can approach her to start one. Jason Strutt’s (Jacob Warner) tennis career is more about his perception in the media, and Josh knows more about Jason’s tennis from watching it on television (as does Bunty we later find). 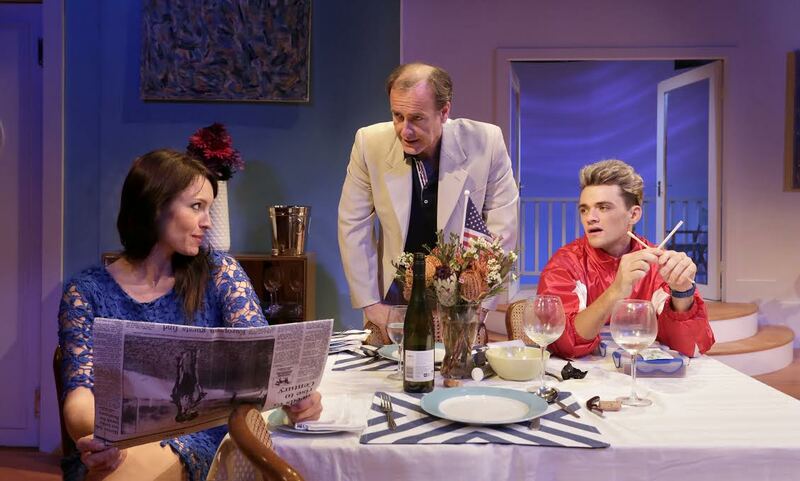 Enright couches the entire play in the classic sitcom setting, the lounge and dining area of a family home, with a swinging door to the kitchen and two exits. This is the precise setting of famous American sitcoms of the day like Happy Days, Family Ties and Laverne and Shirley. It is also the setting for that famous Australian sitcom of the 80’s, Kingswood Country. 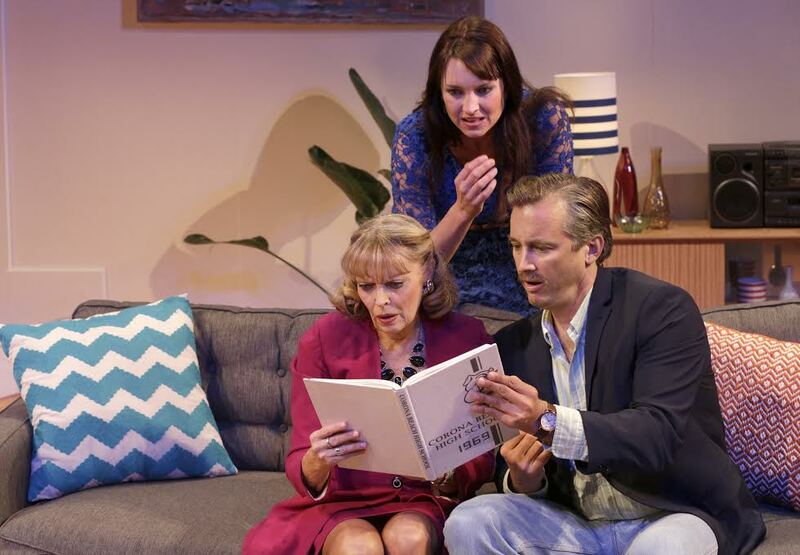 Adam Cook, who has his own personal history with Enright, has the warmth of connection, wit and understanding to keep the play precisely as Enright saw it, so that none of this importance is lost in this current interpretation at the Darlinghurst Theatre. The setting is 1980’s sitcom in Sydney’s Pittawater region, awash with anemic pinks and powder blues, that blur into a sunset that heralds the onset of the crucial hour that will be lived but forever lost due to Daylight Saving. The walls of the Finn household loom large over the top of the cast giving a strong sense of that fake sitcom dominance in the definition of culture. As Felicity comes to the crucial point where she will decide to have an affair or leave, the tropes of the sitcom come to haunt us – the dizzy neighbor (Helen Dallimore) the hopelessly off the mark and yet razor-sharp mother (Belinda Giblin) the seductive ex boyfriend (Stenlake) and the oblivious self-absorbed celebrity (Warner) all make their comedy-of-errors entrances and exists equally contributing their defining stake the fate of the marriage. 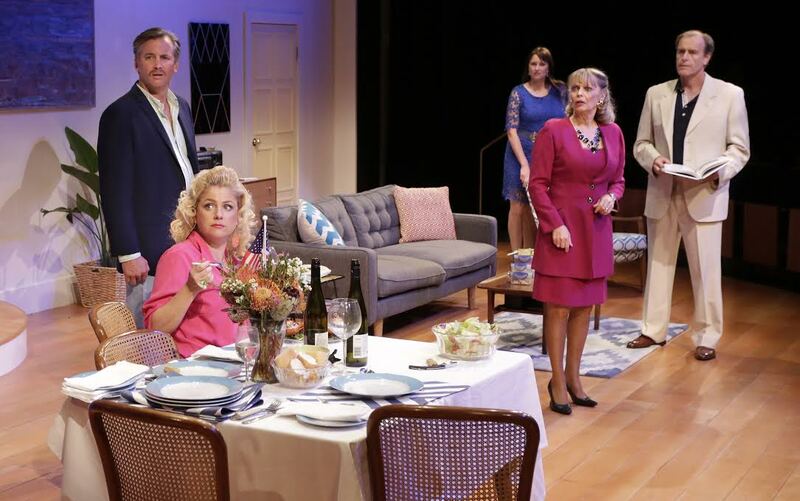 Cook moves everyone around with great energy, making the most of a superb cast (Belinda Giblin and Christopher Stollery are particularly well cast here with their 80’s television roots) and a great script. Even Enright’s ending (no spoilers) is clad in the supercilious cheer of the happy-ever-after of the situational comedy. All his points, including the one about that sleight-of-hand moment that can bring the very real institution of marriage down, are subtle, but preserved in Adam Cooks beautiful production that includes all the joy and easy consumerist pleasures the sitcom affords. It’s a deceptively deep and complex play, written by a gay man for whom marriage was beyond reach. 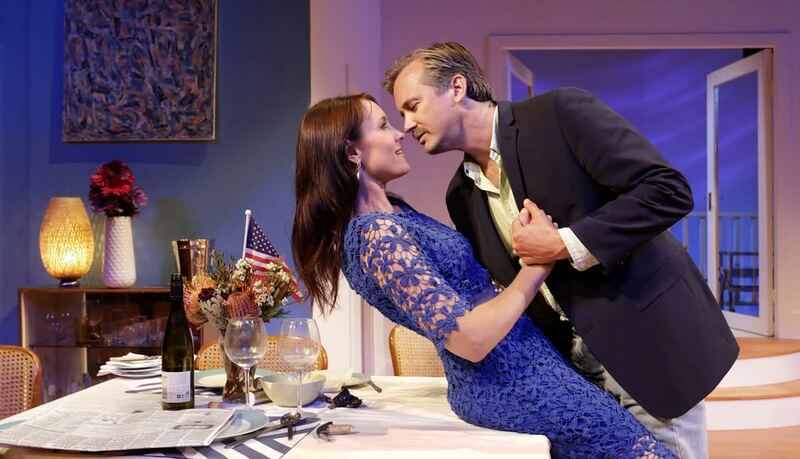 Seen as a commentary on the importance of marriage as institution, the deceptive ease with which that can be torn apart by technological media and the power the small family screen has in defining our lives through our subconscious, it is a remarkably prophetic play, truer today than it was even then.